A group of California musicians tap into the heart and sound of The Congos’ Jamaica. It’s Christmastime in Jamaica, but the red and white Santa decorations dotting the store windows are overwhelmed by orange and green campaign posters for the upcoming 2011 general election. 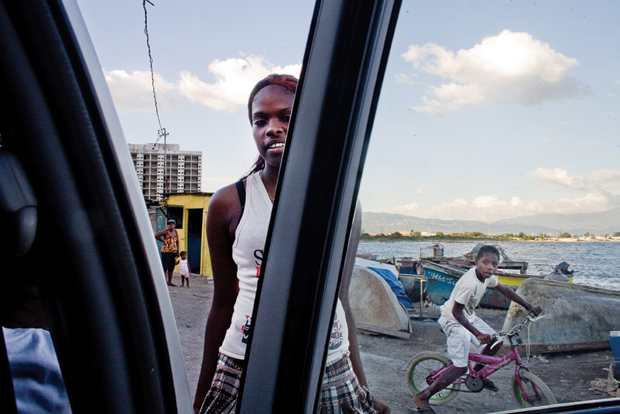 Right outside the music mecca and capital of Kingston, lies the modest town of Portmore. There, tucked behind a cluster of unpaved streets in the Gregory Park neighborhood is an enormous metal gate with “DI CONGOS H.Q.” painted on it. 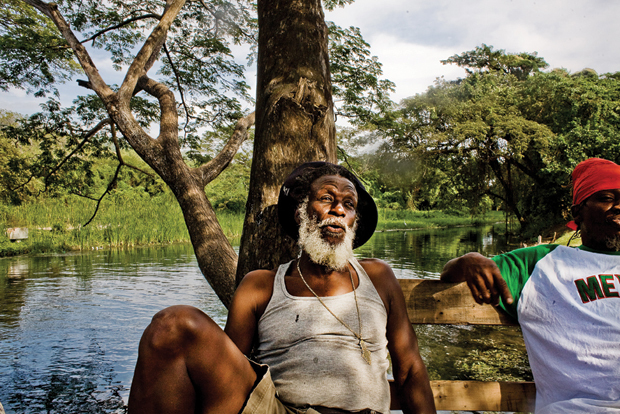 For the last three decades, roots reggae group The Congos have been steadily building their physical and spiritual home here, and what lies beyond this barrier is much more than a house with a music studio on a walled plot of land shaded by enormous trees. This is a Rasta place. Neighbors call it the lion’s den. Friends drop by hoping to jam or simply share conversation over roast breadfruit or coconut or spliff. Outside, acrid smoke rises lazily from the trash fire (garbage collection is non-existent here), and extravagantly-colored hummingbirds dart frenetically in the warm air; the quiet of this Sunday morning is broken only by the tinny notes of “Fisherman,” the Congos most famous song, squeezed into a ringtone. Roydel Johnson, aka Ashanti Roy, a powerfully-built, dreadlocked man in his mid-sixties, retrieves the phone from some hidden pocket and answers: “Fire Burn!” Roy sits on a rough-hewn bench, directly across from a huge mural painted on the side of his house. It depicts the Last Supper, except Jesus Christ has been replaced by Haile Selassie dressed in full Ethiopian regalia, and there are 13 disciples instead of 12, among them Malcolm X, Paul Bogle, Bob Marley, two women, Roy and his son. There’s a Bible and a watermelon (partially eaten) and a bong, which, here, is called a chalice because herb is sacred and before you smoke it, you should give thanks to Jah. When Lee “Scratch” Perry recorded The Congos on his Black Ark 4-track back in 1977, producing their seminal record, The Heart of the Congos, he may have got that heart on tape, but its spirit is renewed daily between the people in this yard. 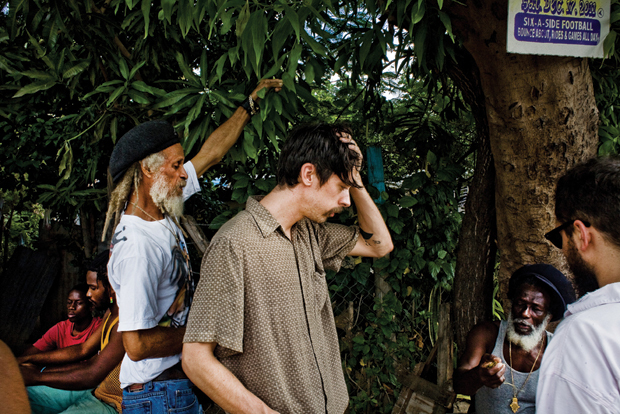 In January 2011, Los Angeles-based musicians Cameron Stallones and M. Geddes Gengras came to The Congos’ compound in the hopes of capturing a piece of that spirit. The process began months earlier, when RVNG label boss Matt Werth invited Sun Araw (Stallones’ solo project) to participate in his Frkwys sub-label, which is dedicated to pairing young artists with influential musicians from an older generation. The Congos were proposed, and the band accepted. Stallones, in turn, asked musician and studio engineer Gengras to join in on the project. It was the first time in Jamaica for both of them, but Stallones and Gengras did little in the way of tourism on that trip, breaking only for sleep and leaving the lion’s den only to fuel up at Drummerman’s ital food shack around the corner. Now, a few days before Christmas, they return with the bounty of that epic one-week recording, and a rough cut of the footage filmmakers Tony Lowe and Sam Fleischner shot during those sessions. Back then the question on everyone’s mind had been: What are we making? Now, closing out the year, they’re faced with its existence. The songs on the resulting record, Icon Give Thank, form a challenging, beautiful document of a week of intense work. And now Stallones, Gengras, along with Werth, Lowe and Fleischner reunite with The Congos on this lazy Sunday afternoon to reckon their creation, but first, they’ll have a taste of the Jamaica they missed the first time around. The Rae Town weekly street dance has been dedicated to oldies since it started back in 1982. Even around midnight, before things really heat up, the Sunday night scene is popping. Dapper grandparents dressed to the nines sway to songs that were young when they were. Mohawked twenty-something ladies strut fearlessly. “Yuh badda den dem?” a man with no prospects asks a 200-pound woman in skin-tight clothes. “Yeah, I’m badda den dem!” Rudeboys on motorcycles preen up and down the street, until the crowd on either side of the road swells into a single mass. Food vendors spread outward from the Capricorn Inn, the dance’s epicenter, serving jerk chicken, fish tea, goat skin soup. They could raise their prices but don’t, and this seems to be part of the Rae Town vibe. This is Kingston’s longest running dance, and it is famously, specifically cool—cool like the Heptones sang “Rasta Cool” in ’76, cool like the Wailers on “Old Grey Whistle Test” in ’73. The DJs revisit soul hits, songs that tend to populate the AM dial stateside. But here, everything is shifted. The main melody line sits in the background, the sweet vocals are in the middle, and right up front, rumbling the body, is the bassline’s sturdy, propulsive bounce. The next morning, everyone’s still reeling from the experience, especially Stallones, whose own music may not stylistically align with Rae Town fare, but whose knowledge of it is encyclopedic. Between Lowes, Gengras and Stallones, collectively, the crew can ID nearly every obscure soul, reggae and disco nugget on offer at Rae Town. “Man, it’s weird to say, but that was a peak life experience at some level,” says Stallones, zeroing in on what may be the greatest lesson of Jamaican music culture. “I’ve never seen anything like that in my life. Being able to bathe in records in that way. The most beautiful sounding records. It’s soul music. The whole purpose of this music is to be the most pure externalization of a man’s feelings about romance and love, and to play it that loud on a system like that, and for people to come and it to be the entire community. It’s a necessary thing for the human spirit. 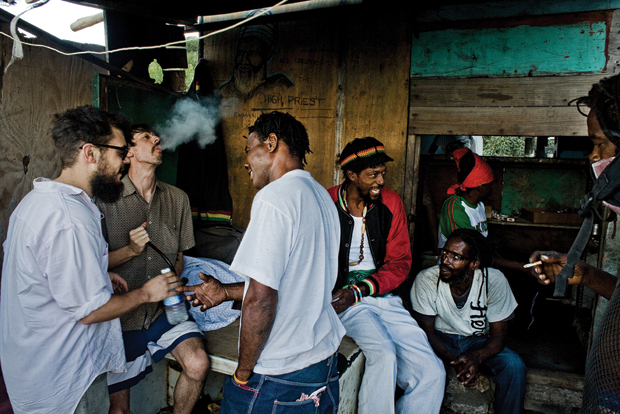 And as awkward as you feel participating in it as an outsider, you’d be a fool not to seize on this ability we have to create something within ourselves and be part of something like that, and do it regularly.” At its best moments, music and community blend into one living thing in Jamaica. Every participant becomes a caretaker. This is why a guitar leans against the holy table in the Congoman Last Supper mural. This is what admiring Japanese nerds wandering around Rae Town know. In the record shops dotting Tokyo’s Shinjuku, one can find all this music alphabetized into neat little racks. But you can’t buy or sell the thing that makes it come alive, this is something inborn. When Stallones and Gengras arrived in January, the vibes were equally good, but musical compatibility was another issue entirely. Stallones’ challenge was to explain how Sun Araw’s strange musical shapes would fit into the Congos sturdy, ancient sound. As Stallones remembers it, “They said, This is very different. [And I said], Yeah, I know! But I don’t know what else to do. I don’t make songs.” It’s easy to see why the Congos were thrown. Sun Araw tracks begin as improvisational sessions, which then get overdubbed, edited and otherwise transformed. Stallones uses audio to brew swampy spiritual spaces; to think of what he does as songwriting is to miss the point. Stallones and Gengras needed to establish some common ground for the Congos to latch onto, something to explain these lush, shattered soundfields they’d sketched out in LA. After that initial strangeness, the solution turned out to be simple: “It’s chants,” Stallones said. “Think of it as chants.” “Chants? Okay.” And then it clicked. Orienting the Congos toward the spiritual was an effective entrée to Icon Give Thank. Dreamlike melodies build up from snatches of instrumentation. Near-incidental percussion hits insinuate rhythms more interested in creating space than tempo. Inside that shimmering, shuddering sound float ethereal vocal harmonies. The Congos combine their most blithe lyrics to date with gravitas. 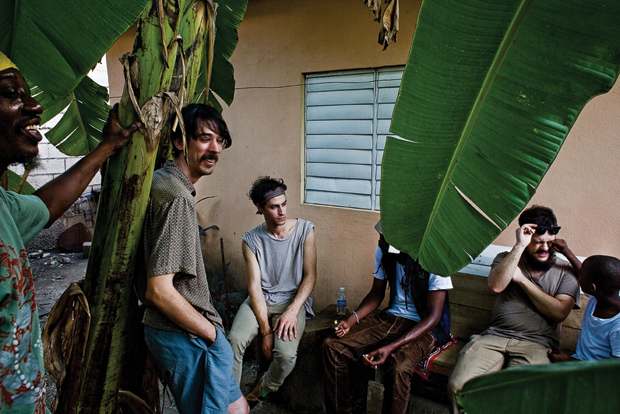 Rather than construct each track sequentially, the group would work off one riddim in a flash of inspiration, then move to the next, slowly growing each piece by incorporating vocals and instrumental overdubs in an organic, open-ended way; Gengras even earned the honorary title of Engineer for his facility with the Congos’ equipment. On record, there are no dub reggae clichés of echo or bassline, the LA duo learned well enough from Lee Perry’s use of quiet background clatters and out-sounds how to spook the track with vibe. “They’re coming from a tradition that I have a huge amount of respect for and don’t wanna disrespect,” explains Gengras, an affable guy with round glasses and a full bushy beard. 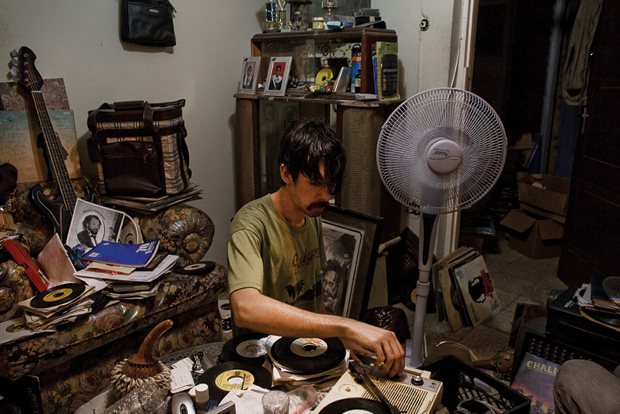 “But at the same time, we didn’t want to make a reggae record. That was first and foremost in our minds—that’s the worst thing we could do.” In the end, the collaboration’s greatest show of respect turned out to be its quietest. On both visits, Roy silently ceded his two best rooms—including the master bedroom—to a bunch of strange white kids half his age who he’d never met. This humility set the tone for all interactions in Congos HQ. Harmony accepts no divas. On the last afternoon of the visit, Roy and Myton gather around a television with Gengras, Lowe, Fleischner and Werth in their two-room recording studio to screen the album’s companion film, Icon Eye. 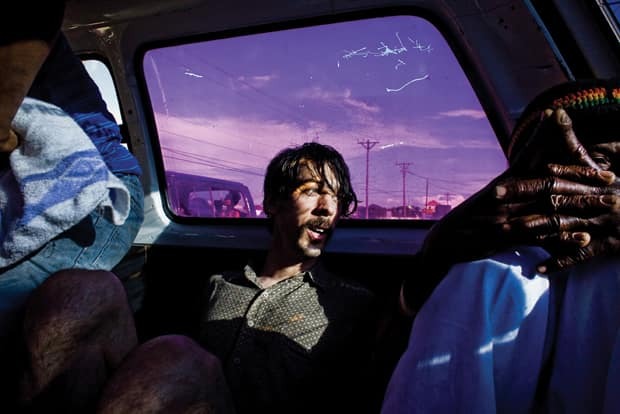 In the film, images of daily life unspool. An early scene lingers around some guys hanging around the yard. “For the past two minutes I’ve just been seeing legs,” complains Miss Williams, the managerial arm of the Congos. She has a point—it’s a sweet, if mundane moment. Mostly you just see legs. The crowded studio falls silent, and a half-beat before that noiselessness turns awkward, director Lowe, who looks like he could be Stallones’ fraternal twin, speaks up in defense, “It’s an experimental film, I was trying to capture the feeling of being here.” Everyone listens, and they discuss. The Rastafarians call this “reasoning,” and throughout the course of this project, there has been a lot of it. This type of face-to-face exchange holds truer weight than written accounts, and keeps folks steeped in the immediacy of the moment. As the film rolls on, the atmosphere softens. Women and children who live in the compound gather in the doorway to watch, and soon it feels exactly like the Congos are screening a private, home video, pointing out tiny details, laughing as a benevolent camera reframes their everyday lives. 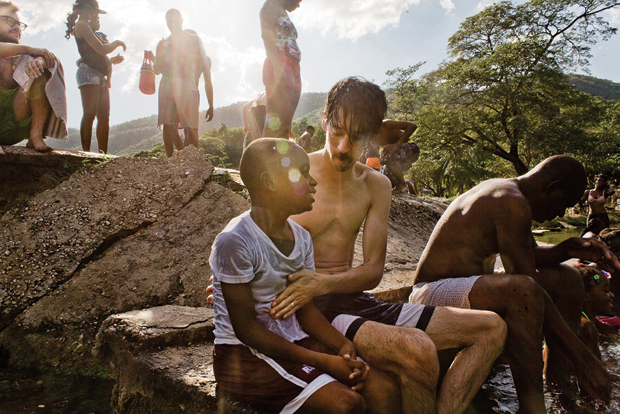 In the end, their edits to the film are few: all swears in patois and English must go. They sing spiritual songs, no need for outsiders to catch offhand vulgarity. “‘Fuckery’—that word can stay—it’s so ancient!” cedes Myton after some debate. This light cleansing makes sense, especially when so much care has been taken to express things correctly at home. Images of Afrocentric pride cover the Congos compound inside and out, and every wall’s a black pantheon where men with hair like tree roots metamorphose into lions. No line divides the mundane from the spiritual here, and the film successfully conjures the weirdness of this crash-course creation and how sudden harmony, between voices or sounds or ideas, can make you gasp with beauty. This casually serious approach to sound is shared throughout Jamaica. You find it spinning around the radio dial or in little kids tunefully singing badman lyrics—you can’t not pay attention to sound because it is ever-present. Doesn’t matter if you’re in bed or skanking in front of the homemade speaker stack blasting from an impromptu street party a half-mile away: how can anyone fall asleep when the DJs’ pacing and presentation is so thrilling? There are many perks to life in this ultra-saturated music environment where sound is publicly scrutinized at every point of its existence. When the DJ drops George Michael’s “Careless Whispers” (the only American pop song played the entire night) and starts spiking the chorus with laser sounds, it’s a revelation. It’s not just that the music really is better in Kingston (although this is often the case), it’s that one hears music you have already heard made unfamiliar in the best possible context. Which, at 1AM on Tuesday right before Christmas, is George Michael. With lasers. The evening’s other sound is dogs—a ragged chorus flares sporadically throughout the night. Not pets; protection. Neighborhood parties spread Christmastime cheer, but the looming elections keep everyone on edge. In Jamaica, both major political parties (the Jamaican Labor Party and the People’s National Party) arm gangs, and those gangs clash. As this dance peters out, over in Spanish Town cops find Navardo Hodges of the Clansman gang with a bullet through his head—and the rest of his body a few blocks away. 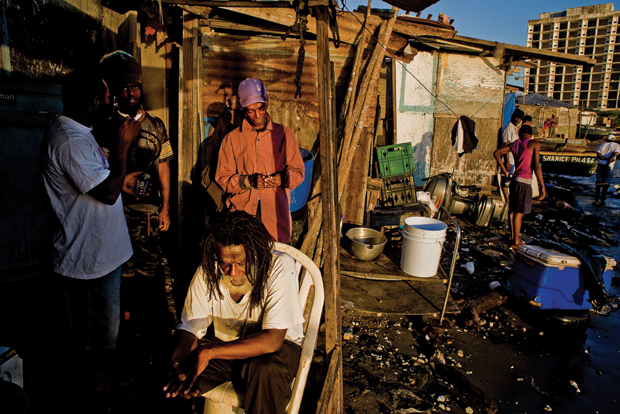 Violence in Jamaica crescendoed with the 2010 extradition of J.L.P.-supporting gangster boss Christopher “Dudus” Coke. The murder rate has since plummeted, but over a thousand people are murdered in the small country each year. After the Icon Eye screening, Likkle David, The Congos’ guitarist, discusses the brutal situation in Jamaica gently. “Music keep our mind from worrying about every problem,” he says. “Music take us out of our environment. And [when] we do music we see, we go in a different world in our mind. Even though we’re right here. It’s a form of transcendent feeling. To really stand in one place and jump up. You jump and you never move. You have to have imagination or you’re nothing. You’re hungry and you don’t have nothing. And you can’t find nothing. All you can find is this song, this sound inside of you. Before you know, you start to think about this sound, and then you forget about hungry. For a few hours, four, five, six, eight hours. And that just repeats itself until another day. And a lot of people survive like that for a while. Some don’t.” David’s limpid guitar lines grace Icon Give Thank closer “Thanks and Praises.” His painterly notes direct us towards the sky in colors so pretty they hurt, rising on some unimaginably gentle breeze. Clocking in at over eight minutes in length, “Thanks and Praises” is the album’s longest song. And it always ends too soon. Imagine a flawless spring day or extra Novocaine, weightlessness rocked by a tidal flow, the sonic equivalent of floating off a gorgeous Caribbean beach that you don’t have to have money to stretch out on. Forever, forever harmonize Myton (high) and Roy (middle) and Burnett (low). 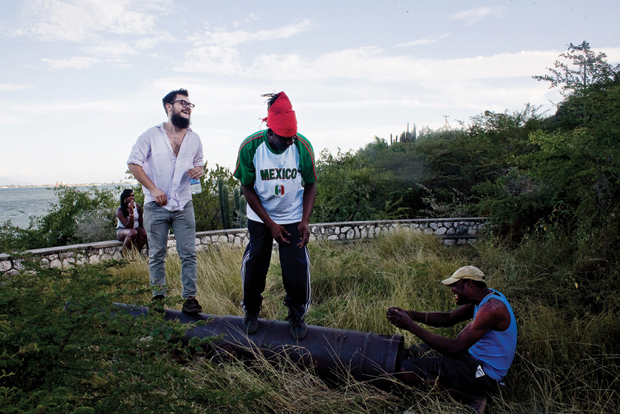 To produce effective music with borrowed Jamaican voices is no major feat. There’s a long and often acrimonious history of foreigners doing just that, but like newlyweds vacationing at Jamaica’s all-inclusive, walled-off coastal resorts, it is a transaction that fails to enrich the community. To produce music as cohesively weird and emotionally rich as Icon Give Thank requires Jah’s blessing and a comfort-level bordering on familial. Stallones and Gengras did the complicated thing of going to the lion’s den and surrendering to its rhythms. 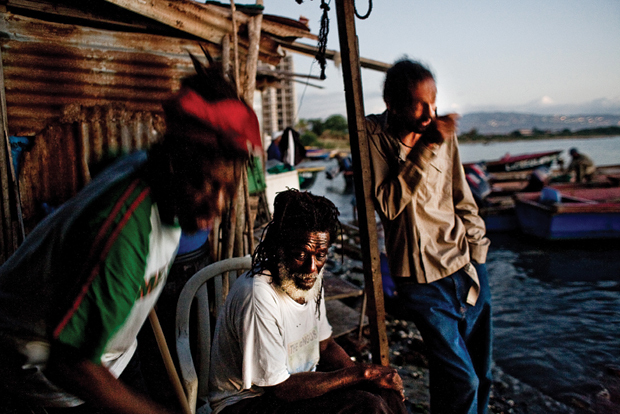 Like the Rastas, they activate music as a spiritual pathway. Improvise, elevate, follow a vibe to its illogical conclusion. Humble yourself. Give thanks and praises.